I’m a huge fan of all things Mexican and I think a big part of that comes from the simplicity. 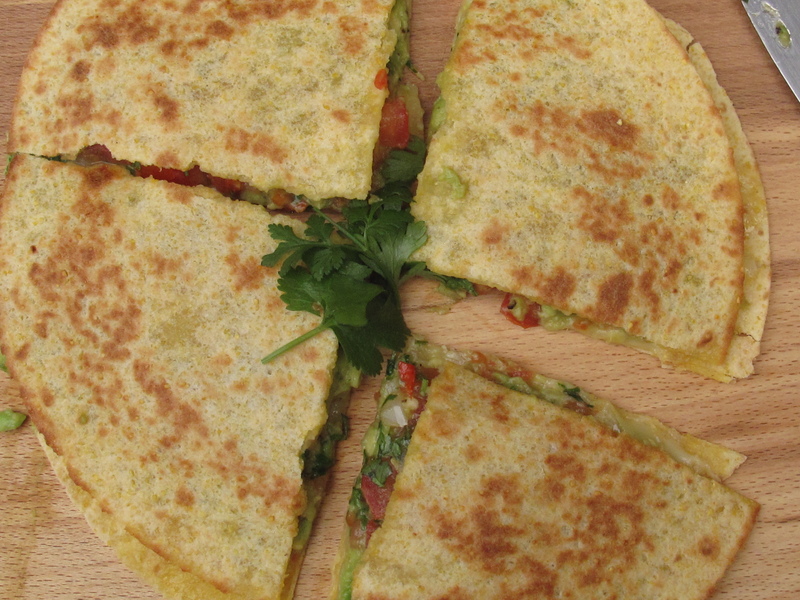 Beans, chillies, avocado, tomatoes, coriander, sour cream and cheese are the basic building blocks. You can use as many or as few as you like. For main meals I often use them all (and some more) but for snacks I pare things down for bites that are easy to put together but more importantly, fast. During the week speed is all. We get home after work, school and creche between 2 or 3 and everyone is STARVING. I always keep a stash of corn tortillas for superfast lunches (yes, yes, I know you can make these so easily but believe me nobody is in the mood for anything that takes more than 5 minutes. More often than not, I make quesadillas. First of all you throw a tortilla on the pan (no oil) with a handful of grated cheese (cheddar works for me but really any hard cheese will do). Toast over a lowish heat and let the cheese melt. 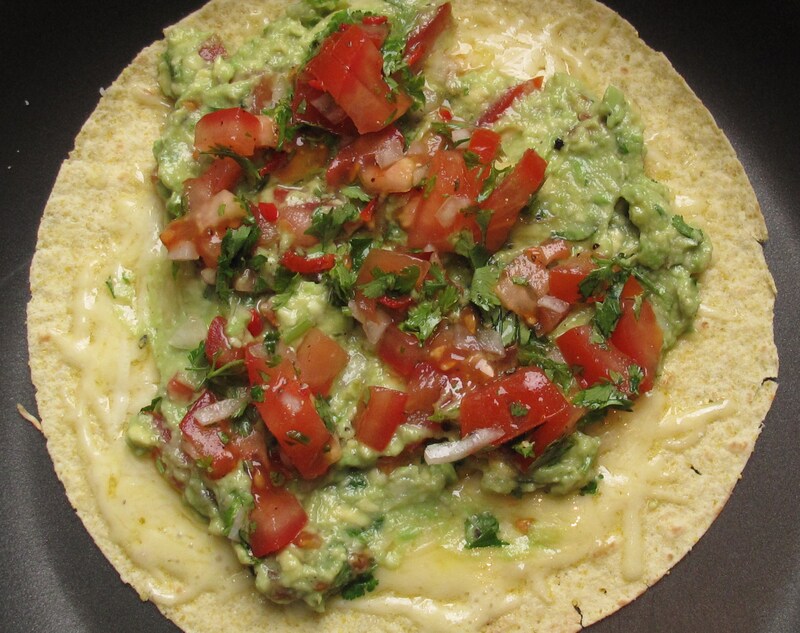 Spread guacamole and/or a tomato salsa over the cheese then top with another tortilla. Flip over so the top tortilla gets toasted. Take off the pan, quarter then eat with a little sour cream on the side. That’s a very basic version. After that the combinations are pretty much endless. Here are just a few…. Salad leaves – anything bar rocket (the flavour doesn’t really go). If I’m using salad I either serve it on the side with a spritz of lime or, instead of using 2 tortillas I use just the one taking it off the pan when the cheese melts, then I add the salad and whatever else I’m having and serve it folded. 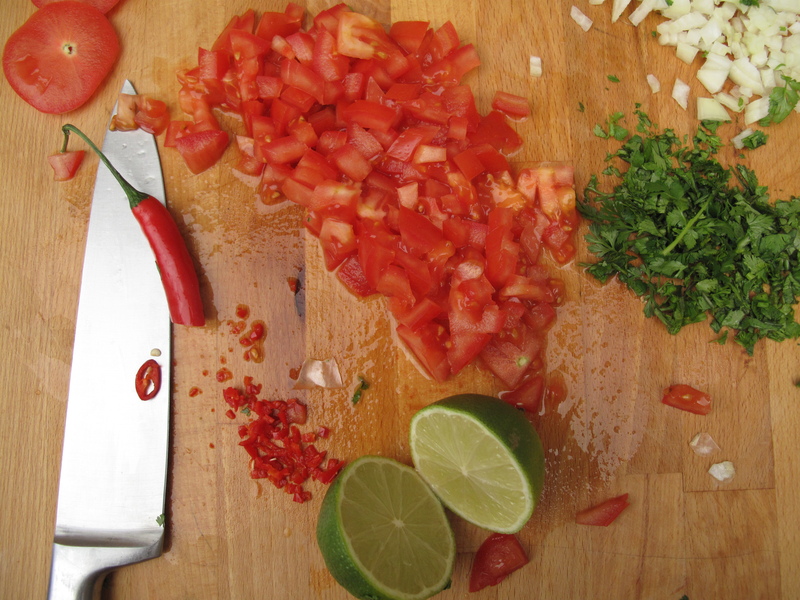 Combine the tomatoes, onions, coriander and chilli. Add a pinch of salt and lime juice to taste. 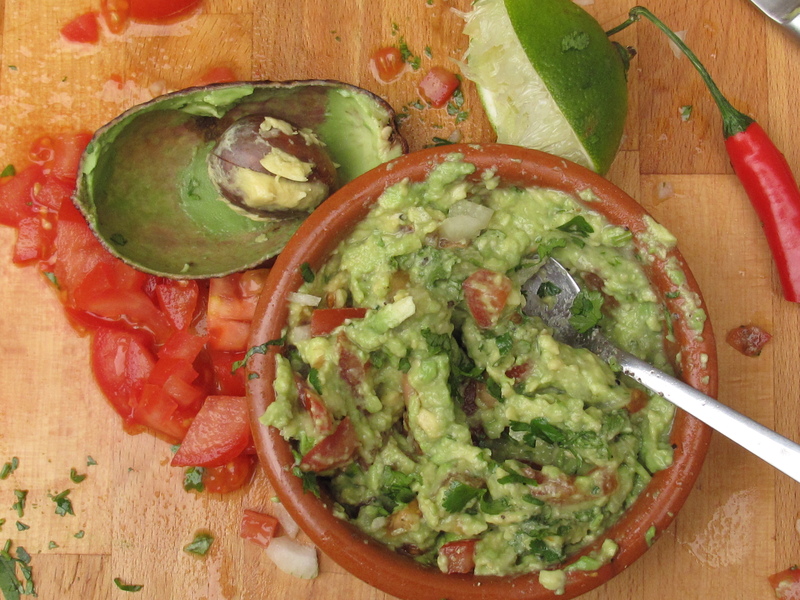 Mash the avocado then mix in the tomato, onion, coriander and pepper if using. Add salt and lime juice to taste. If you’re making this ahead of time a trick is to add the avocado stone back into the guacamole to stop things discoloring. That’s about it really. Obviously this kind of thing isn’t just for snacks and lunches, they make brilliant “I’m too exhausted to cook” dinners – you just eat more! In case you were wondering……. The funny looking fruit in the Mediterranean bags is a persimmon aka kaki or sharon fruit. Known as the fruit of the gods in ancient Greece they have a lovely apricot flavour with a mango texture (yum!). They are perfectly ripe so have them for dessert this evening if you can. Pink grapefruit and avocado are in season at the moment and this doesn’t actually happen when the weather’s hot unless you live in the Middle East. For us both of these are winter varieties. For the colour alone I had to put these two together and salad seemed like the obvious way to go. I also had some spinach and that seemed like a good bet but when I put the three altogether with some olive oil, balsamic and a little honey to offset the tart of the grapefuit the result just didn’t seem quite right. Maybe on a blistering hot day in July but right here, right now……… no. First of all, despite the honey, there was still just too much bite from the grapefruit plus a bit more texture was required. What about cous cous? I love cous cous salads especially with avocado so I got to work toasting some up on the pan. Toasting the grains, if you’ve never done it, adds a lovely smokiness to things. You just stick the cous cous on a dry pan until it starts to turn a lovely golden brown. Then turn the heat way down and add hot water (double the amount of the cous cous is the usual ratio). Stir like mad until all the water has absorbed. At this stage the grains should have plumped up nicely. If they still seem hard, stir in a little more hot water. When the cous cous is done stir in some olive oil to stop the grains sticking together. Let it cool down then add some perfectly ripe avocado, sliced grapefruit, finely shredded spinach and then a handful of toasted pinenuts. Has to be good right? But what about the dressing? 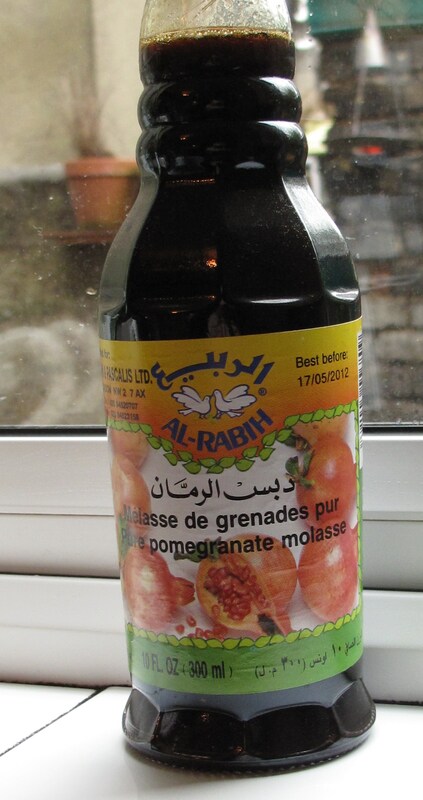 I really was beginning to wonder and then a bottle of pomegranate molasses caught my eye. I’d bought it just before Christmas but still hadn’t managed to get round to trying the stuff . Margaret always raves about it and it’s a staple for Yotan Ottolenghi. So, what is it? Well it’s a pomegranate syrup basically and flavourwise it’s both sweet and sour so very interesting indeed….. especially for salads. One taste and I knew I’d found what was needed. I think this might be the start of something. Apparently you can even make cookies with this stuff. You can get yourself a bottle in any Middle Eastern shop for a couple of yo yos and a lot of delis have it too. Begin by toasting the cous cous as I described above. When it starts to change colour turn down the heat and add the 2 cups of water. Stir until the water has absorbed adding a little more if the grains haven’t cooked fully. 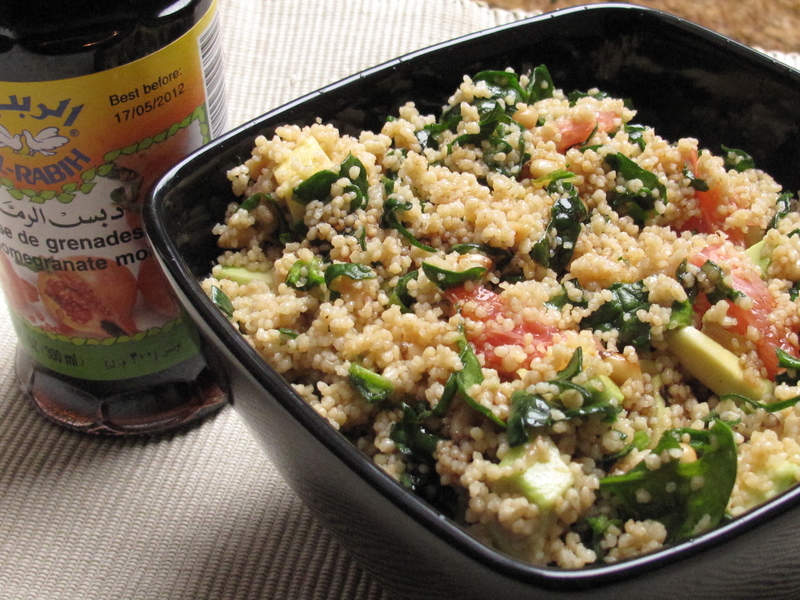 When the cous cous is ready, put it in a bowl and stir in some olive oil. The idea is to coat all the grains so it doesn’t all clump together as it cools down. You can add a pinch of salt at this stage aswell. Set aside and get on with the other ingredients. Toast the pinenuts in a dry pan over a medium heat until they start to change colour then remove and set aside. Peel the grapefruit removing the white pith aswell. I find a sharp knife works best for this. Cut the fruit down the middle, set aside one half then cut the other into segments which you then slice. Peel the avocado and chop into smallish pieces. Along with the spinach mix all these ingredients through the cous cous. Be gentle so the avocado doesn’t go mushy. Make the dressing by putting the ingredients into a jar then giving it a good shake (with the lid on!!!!). Pour over the cous cous and mix the salad again. Taste and add a little more salt if you think it needs it then drizzle with some more mollases and serve. As I said this makes a good standalone lunch especially if you add a bowl of or make a big mezze selection – a nice Spanish omelette, some green salad, olives, good bread, hummus, roasted peppers, a block of salty Feta,….. you get the idea. Either way, enjoy!! This week I’ve included a variety never seen before in our bags – Broccoli sprouts which, like all sprouts, are packed with antioxidants which fight the signs of aging (always good!) as well as all kinds of phytoestrogens which help prevent cancer, heart disease,osteoporosis and menopausal symptoms. Tastewise they have a light peppery flavour and of course they have that lovely crunch too. Add them to almost any salad, sandwich or wrap (we always throw them into burritos). They seem to work especially well with avocado and this week’s recipe combines the two in a salad that has to be one of my alltime favourites. It’s got a completely moreish dressing not unlike last week’s dipping sauce, with ginger and soy sauce along with another favourite flavour of mine – toasted sesame which adds a gorgeous nuttiness to things. The main ingredient is brown rice which, as you know, is amazing for your body. As I’ve mentioned before, I usually make this stuff in bulk, about a kilo at a time, then use it to make all kinds of quick meals during the (usually insanely hectic) week. I like the shortgrained kind but feel free to use long grain or Basmati. Everyone always moans that brown rice takes all day to cook and yes, it does take longer than white but if you soak it first for about an hour (even 20 minutes will do if you’re short of time) the cooking time is halved and it makes it easier for your body to digest. Begin by making the dressing. To do this simple combine all the ingredients, taste then add more lemon juice if you think it needs it. To make the salad simply combine the rice, beans, onion and avocado. Toast the sesame seeds on a dry pan and mix them through. Dress and serve – Yummy!!! ……………and healthy to boot. It’s orange season and the extra special blood variety are just hitting their stride. They’re in all our bags this week and will be for as long as they’re around (about 2 months). If you juice in the morning we’ve got 6.5k boxes that we can deliver along with your veg for 15E. For marmalede makers we’ve got Seville oranges at 4E per kilo. If you’d like to mix it up we’ve got grapefruits too. Just let us know. The big thing about our service is that you don’t really know what you’re getting week to week so quite often we end up cooking out of our comfort zone. This week we have gorgeous pink and white speckled Borlotti Beans for the first time ever. My reason for avoiding them until now was that I didn’t really know what to do with them but this week I thought I’d give them a go and the result was fab. Like the Broad Beans we’ve had over the summer months they need shelling but only once – you don’t need to get them out of their skin once cooked. The other big difference is that they take a lot longer to cook than other beans. Giorgio Locattelli reckons that they’re done when the skin as well as the actual bean is soft and this takes about 40 minutes so be careful to check that they really are cooked before you take them off. Once cooked, they are great in soups, stews and salads (try them with this week’s Rocket and Tomatoes dressed in Olive Oil and Balsamic). Giorgio has a beautiful recipe with prawns which definitely looks like it’s worth a try if you have his book. The other way they are often served in Italy is with a tomato sauce along with herbs like Sage or Rosemary. This is the route I took and it was one of the nicest things I’ve eaten in a while. We ate them with a trout, this week’s New Potatoes and a warm salad of Courgettes and new Onions. It was all lovely but the Beans were definitely crying out for lamb and I’m looking forward to this for tonight!! Put the shelled beans in a pot and cover them with about an inch of cold water. Bring them to the boil then reduce the heat slightly and continue cooking til done. Once the beans are cooking get on with everything else. 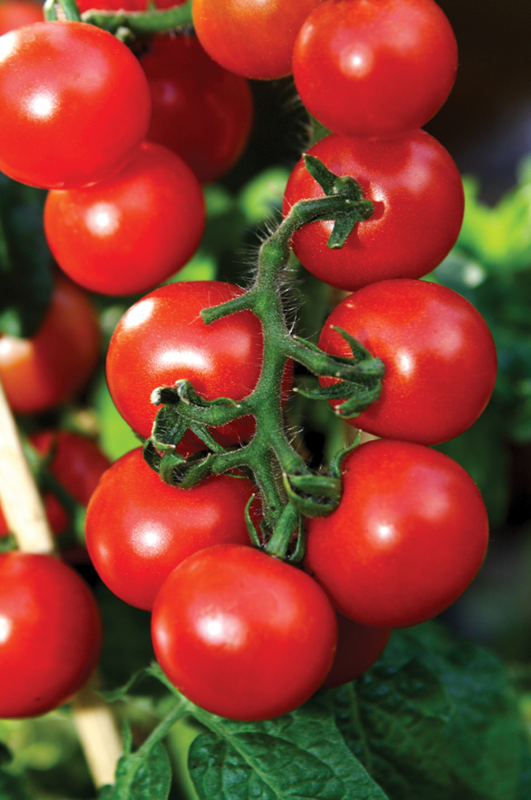 Plunge the Tomatoes into boiling water, leave for a minute or 2 then peel and chop them. Peel the Garlic and slice each clove finely. Heat a generous amount of Olive Oil (1/2 cup) and then throw in the Garlic. Saute gently for a minute or 2 before adding in the Rosemary (or Sage if you prefer). When the Garlic has softened (but not changed colour) add the Tomatoes and a pinch of Salt. Stir over a medium heat for about 10 minutes before adding the Beans. Cook for another few minutes the serve hot, warm or cold (it makes a lovely salad). Enjoy!! This week’s New Potatoes are the Sharpes Express variety (apparently very difficult to grow but well worth it as so many of you have been commenting on them) and they are best steamed. Start with the biggest ones then add in the smaller guys over time so they’re done at the same time. Try them in a salad with this week’s Rocket(Arugula) and Avocado and some smoked Cheese with a Sherry Vinegar dressing if you have it. On the subject of vinegars -I recently got a Pomegranate one which we’ve been enjoying a lot recently. The Courgettes and Onions we had with the fish the other night were cooked on the pan in Olive Oil and then I added a splash just before taking them off the pan which cooked down and sweetened and the end result was lovely. Celery, Parsnip and Spring Onions ! Spring is truly here. Everything is in flower and growing. The fruit trees are flowering and lovely to see walking through Rathmines. The magnolias are in full bloom. The streets are carpeted in pink blossom. And under the trees is lots and lots of wild garlic… Lovely white star shaped flowers. I will be making pesto with it today. I hope Sarah is having Springtime on her hols…. In the garden the broad beans are flowering. This is a transition time. Winter veg like spinach are about to finish in the next few weeks; it is a little early yet for the new veg of spring. Scallions (spring onions are up) having overwintered. Parsnip is still in season from winter. The new season wet garlic is in. This week we span two seasons, that ending and that starting with parsnip, celery and scallions…. I took some time off in my thirties and travelled. I loved New Zealand.. the spectacular scenery.. The mountains.. the fields of lupins . I loved, loved the seasonal food and the wines. In every small town was a bakery and in that bakery every day were baked fresh seasonal muffins, pear, pumpkin and feta, roasted veg. Before this I knew muffins from travelling on business in the US – horrible sweet factory made junk. I was converted.. I bought this little book by the New Zealand doyenne of muffins Alison Holst called Marvellous Muffins(http://www.holst.co.nz) and have adapted a few recipes below for you. Let me share with you some recipes for savoury muffins to have with soup and some sweet muffins to have with friends. If you have kids bake them with them. If not share them with friends who will be so delighted to get something home baked as so few people bake now. Sieve dry ingredients into a bowl. Add cayenne, grated cheese and chopped spring onion and stir well. Cook bacon in pan with no fat or grill and then chop finely. Melt butter add eggs and milk and beat. Halve avocado, skin and cut into cubes, Sprinkle with lemon juice. Add to liquid mixture with bacon or sun dried tomatoes. Fold two mixtures together. Put into either muffin papers in a muffin tray or into a silicon tray (optionally adding sprinkle of pumpkin seed)and bake in a preheated oven at 200 C for ten minutes or until the muffins spring back when pressed with a finger. This recipe can be varied… chunks of roasted parsnip with rosemary and feta and a parsnip, rosemary, olive and feta soup. crunchy chunks of celery mixed with ham and blue cheese, Roasted squash, feta and pumpkin seed… Roasted red pepper, roasted tomatoes… Go for it ! It is nice to put in a little wholegrain or spelt flour but beware. These flours go off fast so buy in small quantities and use fast. If the weather keeps up serve this soup chilled with the hot muffins.. Really great. The soup is very low cal so makes up for the cheese and butter in the muffins. Tomato, apple and celery soup. Melt the butter in large heavy bottomed pan. Add onions and celery and cook for ten minutes stirring until onion soften. Then if serving hot bring soup back to the boil add sugar and season. If being fancy put on top a dollop of yoghurt or creme fraiche and some of the chopped reserved fronds and finely chopped spring onion greens. This recipe is adapted from a great book called Eat Well Stay Well by Good Housekeeping (http://www.goodhousekeeping.com/). I highly recommend this as a cookery book and also as a great resource for cooking for special diets. This soup is suitable for low fat, low cholesterol, low calorie and diabetic diets (and gluten free if careful re stock). For those of you on vegan diets put a handful or red lentils in when adding the tomatoes to increase the protein. potato salad with chopped scallions, mayonnaise (I mostly use bought), a tbsp of whole grain mustard and a squeeze of lemon and maybe stuffed devilled eggs (with or without anchovies). Hardboil eggs remove yolk mash with mayonnaise and paprika, Add chopped scallions and maybe some anchovies. If you have courgettes in your bag this week this is a good opportunity to roll out the marinated grilled courgette recipe I gave you last week. Another lovely option is celery sticks and carrot batons with hummous (can of chickpeas pureed with lemon juice olive oil and garlic and tahini with lots of chopped garlic on top) or with a blue cheese dip. Hope you have some left to juice !! Sieve the first 5 ingredients into a bowl. Add sugar, walnuts and sultanas and mix. Savoury muffins are great for a lunch box and will keep for a few days in a tin. Sarah will be back next week but in case you miss her here is a link to a posting on scallions she did for a veg box recipe site in the UK. http://blog.vegbox-recipes.co.uk/2009/03/09/marchs-third-veggie-in-the-spotlight-over-wintered-spring-onions/ for Panfried Spring Onions with Goat’s Cheese and Toasted Pine Nuts.